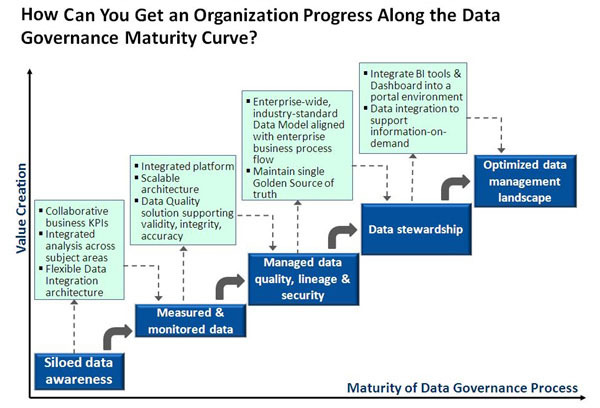 Data governance in higher education is an interesting topic. Most colleges and universities operate in a decentralized nature to support the various functions of their business. Consider student records (registrar’s office), student accounts, financial aid, admissions, financial affairs, human resources, advancement, facilities, etc. In larger universities, decentralized operations are further compounded by multiple campuses and disparate physical/geographic locations. As data are more prolific in our day-to-day jobs, and big data are ever-increasing, what role does data governance play in the current and future strategy of a higher ed? It should play a major role. But, how? I recently listened to Notre Dame’s data governance strategy on Educause.com. Mike Chapple, Sr. Director of Information Technology Service Delivery, had some interesting insights. He also discussed the use of tools such as the RACI matrix to help steward various data governance processes. All of these topics are relevant – and challenging to centralize. We’re undergoing a similar effort at Georgetown to address some of these areas and to create a “BI Center of Excellence”. We’ve engaged Gartner to learn more about the broader higher education landscape and to glean best practices. This will become increasingly important as we roll out Workday Financials this July. I look forward to these discussions and the opportunity to help better structure reporting operations and data governance in a central operation. What is your organization doing? Where does reporting/BI fall organizationally within your university? Under the CIO, CFO, or Provost? Or, do you have a neutral reporting/data governance organization that serves everyone? Or, do you have reporting centers for each campus that report organizationally into a broader reporting unit? These are some of the questions that we are trying to answer as we design the future state of how reporting and BI are handled at Georgetown. If you are a member of HEDW, they just released an informative data governance survey which includes data from about 25 universities. As we progress further down this path, I will post further about what was ultimately decided to support Georgetown’s efforts.